When conservators are working on archaeological excavations, their work often encompasses many different aspects of field conservation. This can include materials identification and characterization, lifting fragile artifacts and aiding in archaeological research. No matter what facet of the project they are involved in, the work can be challenging without the comforts of a well-stocked lab and requires lots of problem solving and improvisation. 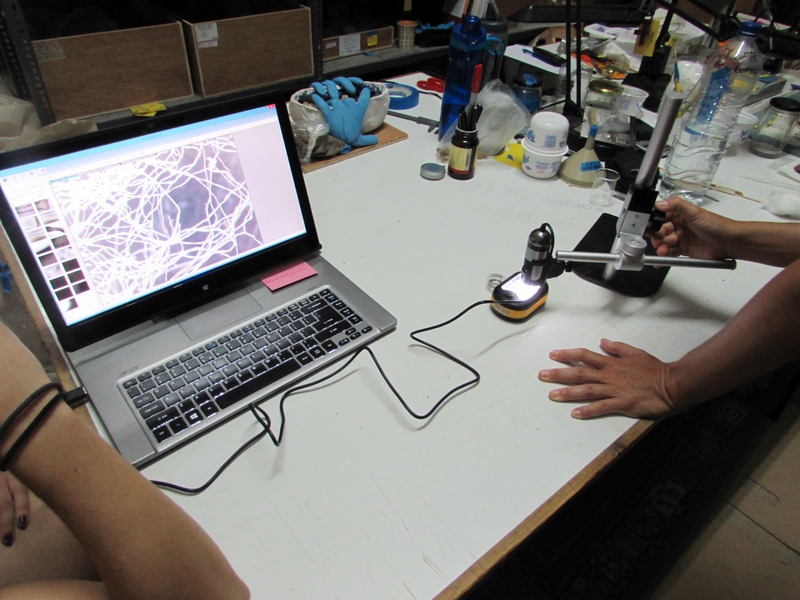 Last summer while working on the Ancient Methone Archaeological Project, we were faced with the challenge of trying to identify an unusual looking fibrous material which required us to MacGyver a transmitted light microscope to aid in the examination and identification of the mystery fibers. During the 2014 season, a team of geomorphologists working on the project were taking core samples in an area thought to be an ancient harbor. In one of the cores, they pulled out a clump of fibers they thought might be cordage (fig. 1). They brought the samples to the conservation lab to see if we could identify the fibers and determine if it was cordage or the remnants of woven fibers. 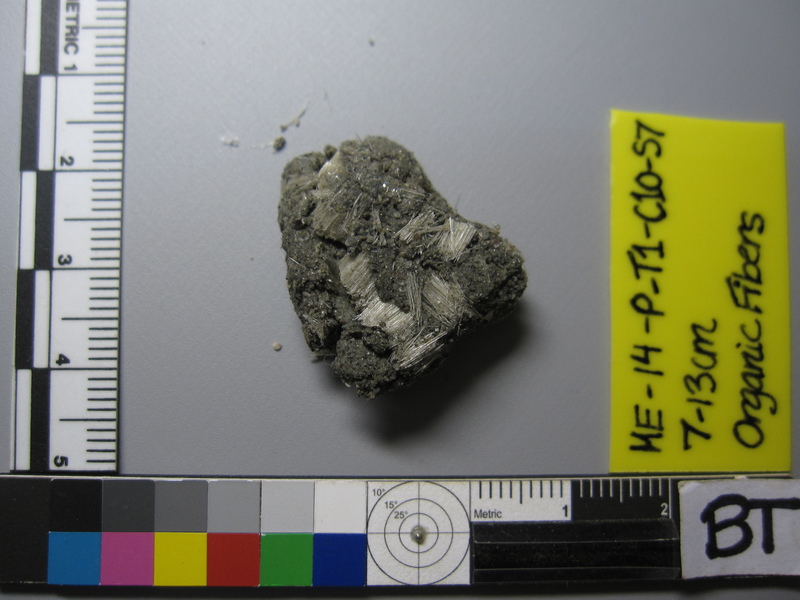 Some samples were set aside for radiocarbon dating and the remainder of the sample, which was still bound in sediment, was examined. The initial macroscopic examination revealed that the fibers appeared translucent (fig. 2). They seemed to be grouped into bundles and some of these bundles initially appeared to cross each other, giving the impression of a woven structure. 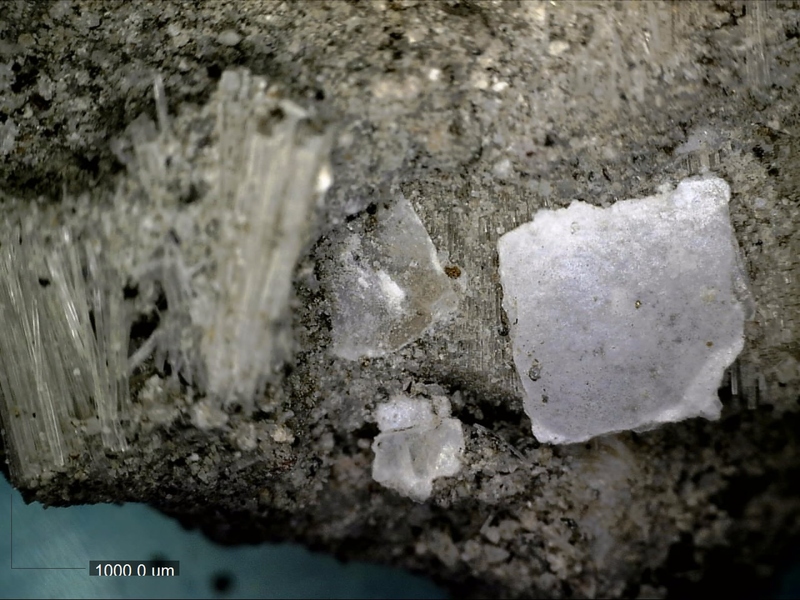 The fibrous material was encased in a gray, silty sediment, which appeared to include quartz, foliated phyllosilicates/sheet silicates (like mica, vermiculite, etc.) (fig. 3), as well as small shells, both fragmented and whole (fig. 4). The sample was initially wet, and was allowed to slowly dry out in the lab. The sediment was gently pushed away using a pin-vise under binocular magnification, to better define the structures and reveal diagnostic features of the material for its identification (fig. 5). 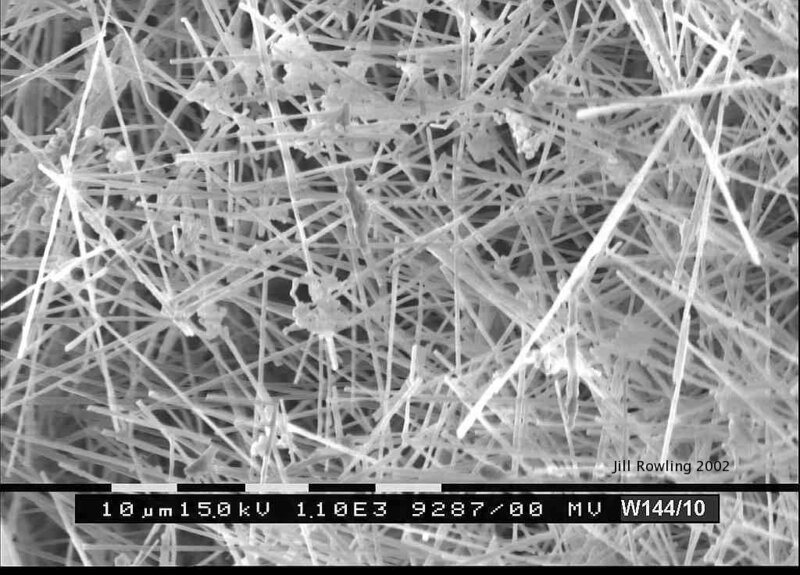 Photographs of the fibers were taken using the DinoLite USB microscope (7013MZT Series). During this examination and initial cleaning, the fibers were found to be very brittle. Though they appeared to be in bundles, they were not actually bound to each other and could be easily separated. Though examination with a stereomicroscope helped to reveal more about the fibers and the structure of the bundles, we were not able to clearly identify what the fibers were. We felt that examination using transmitted light microscopy would be the most helpful since it could highlight any morphological features in the fiber that could aid in identification. 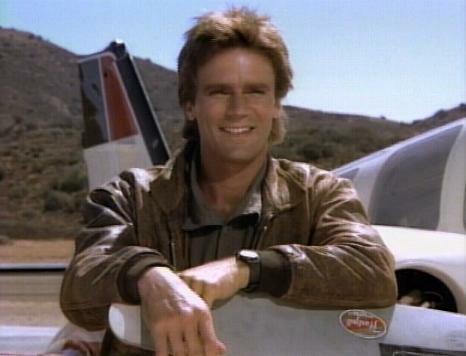 So we set out to make one armed with our DinoLite microscope and a flashlight. The set up turned out to be quite simple. We just needed to be able to shine a light through the fibers from below and examine the fibers at a high magnification using the DinoLite (fig. 6). We took a fiber bundle from the sediment and placed it on a multi-bulb LED flashlight (fig. 7). 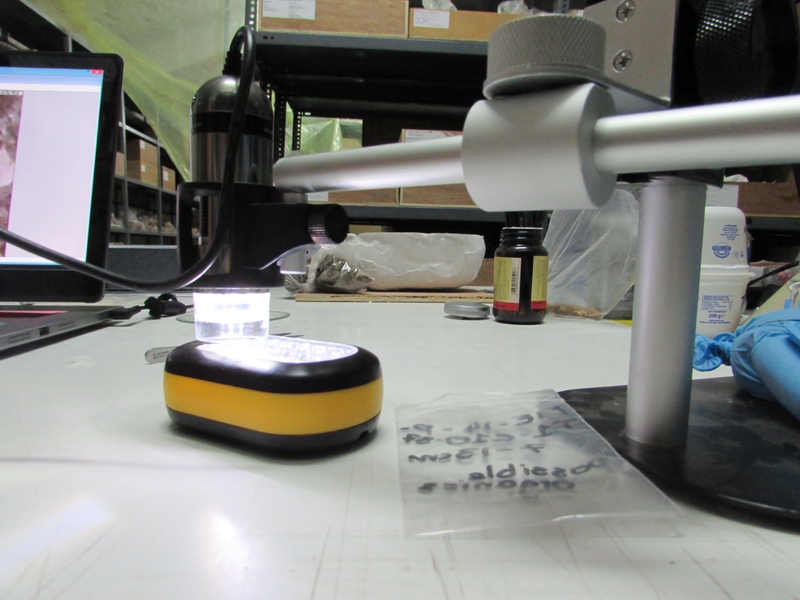 This flashlight was flat and rectangular and the ideal shape for our light source since the fiber samples could be directly placed on the top surface of the flashlight. The fact that the flashlight was flat also meant it was easy to position the light source under the microscope where needed (fig. 8). Looking at the fibers in transmitted light, we observed a central void within some of the fibers. Since we were considering the possibility of the fibers being organic in nature, we thought these central voids could be the medulla or lumen of an organic fiber (fig. 9). However, no other morphological features were present that helped us determine at this point what the fibers were. We were also able to take a look at the cross-section of the fibers with the addition of a polarizing lens on the DinoLite (fig 10). Some fibers appeared hexagonal in section (fig. 11). Some of the ends of the fibers ended in a point or were triangular in shape. Further cleaning revealed a tiered growth structure that resembled the growth of minerals more than plant or animal fiber bundles (fig. 12). 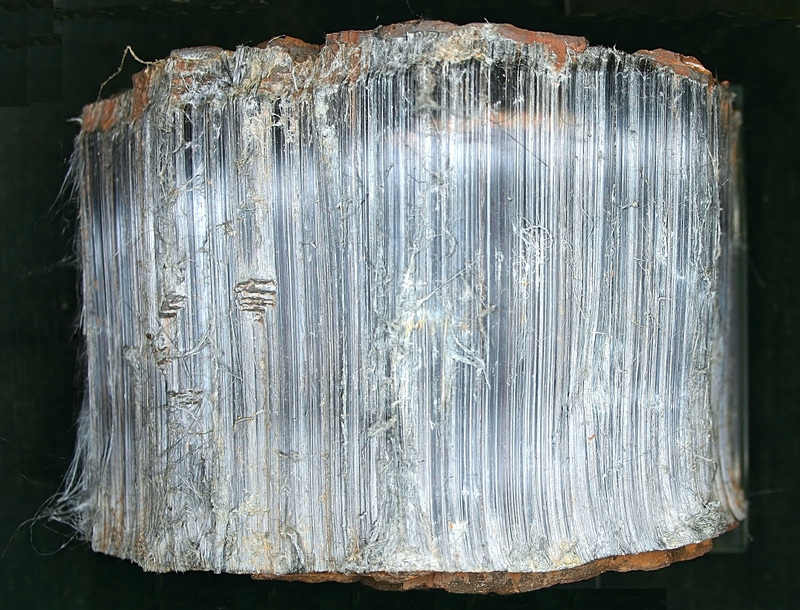 The inclusion of sheet silicates in relation to the fibers, either located between bundles or within them further suggested these fibers were mineral. 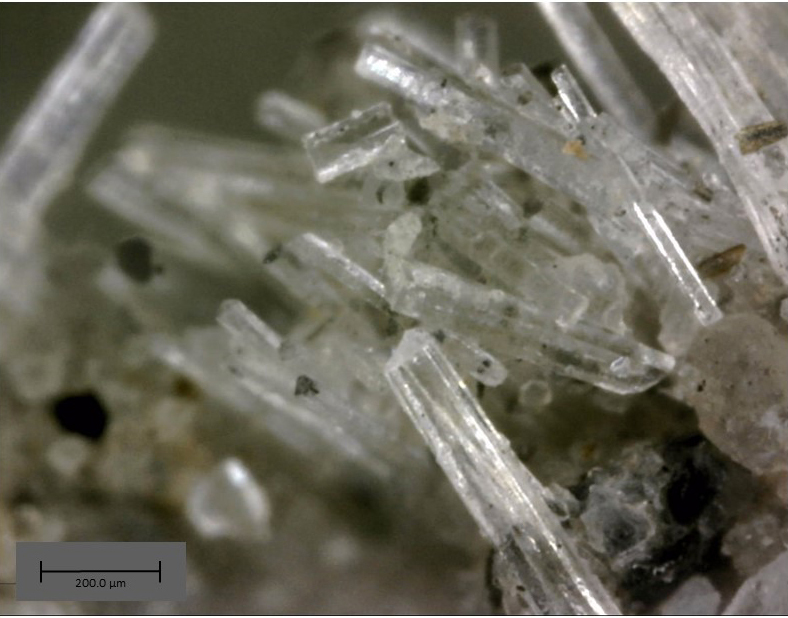 In searching the literature we came across images of asbestos minerals which looked similar to our mystery fibers. 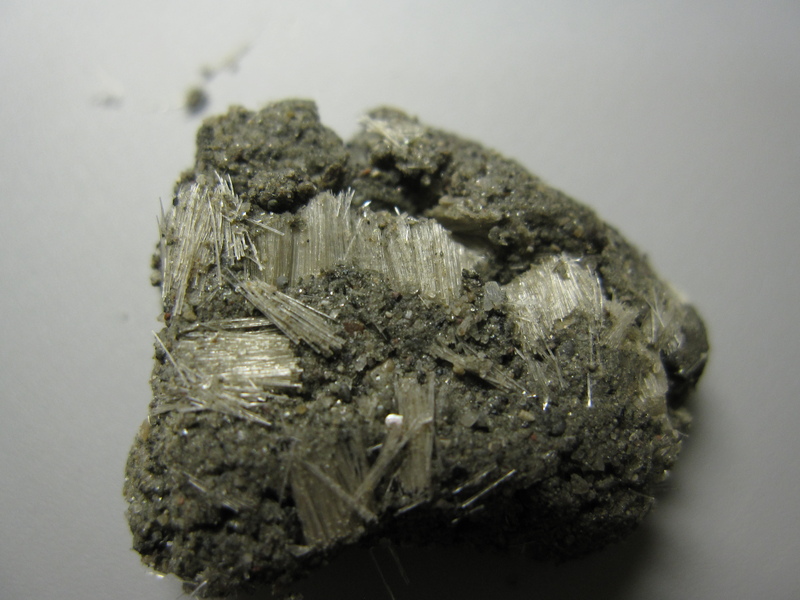 Several types of asbestos minerals are fibrous in appearance (fig. 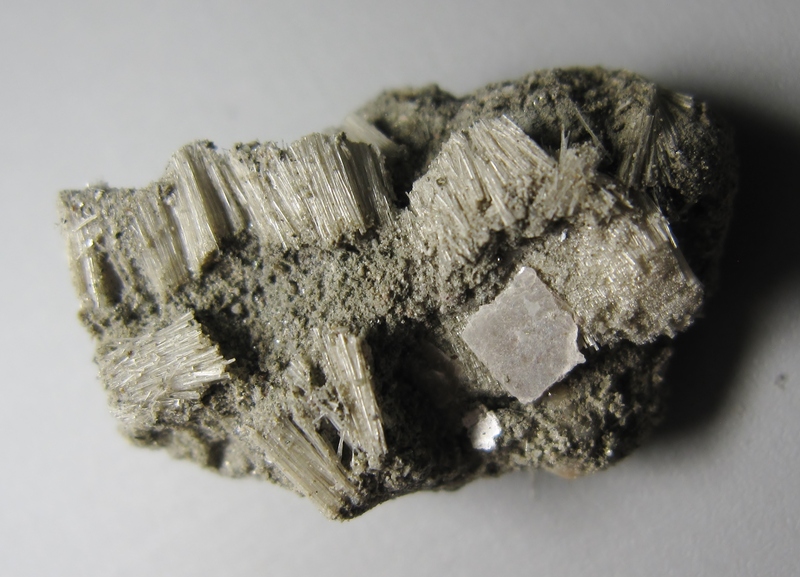 13), and can occur near phyllosilicate deposits. 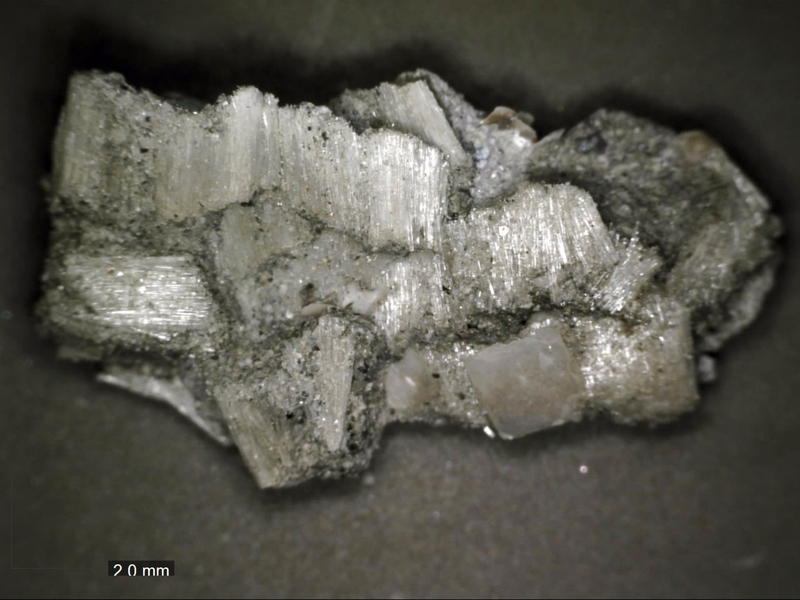 Armed with this information we concluded that the fibers were definitely mineral in nature and could possibly be asbestos. Luckily we were able to bring a sample of the fibers back with us and conduct some analysis in the UCLA/Getty Conservation labs. And we were quite surprised by the results! 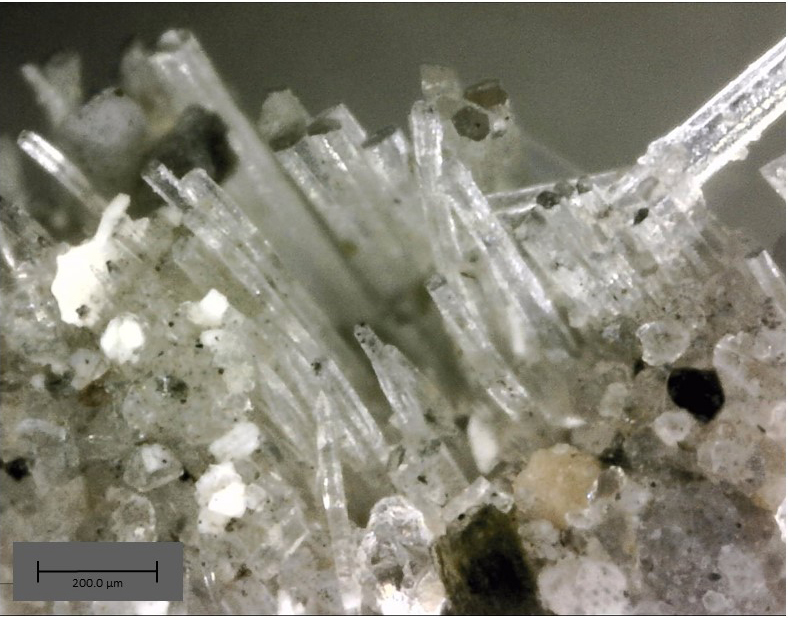 It turns out we were correct in deducing the fibers were mineral in nature, but we were incorrect about which mineral. 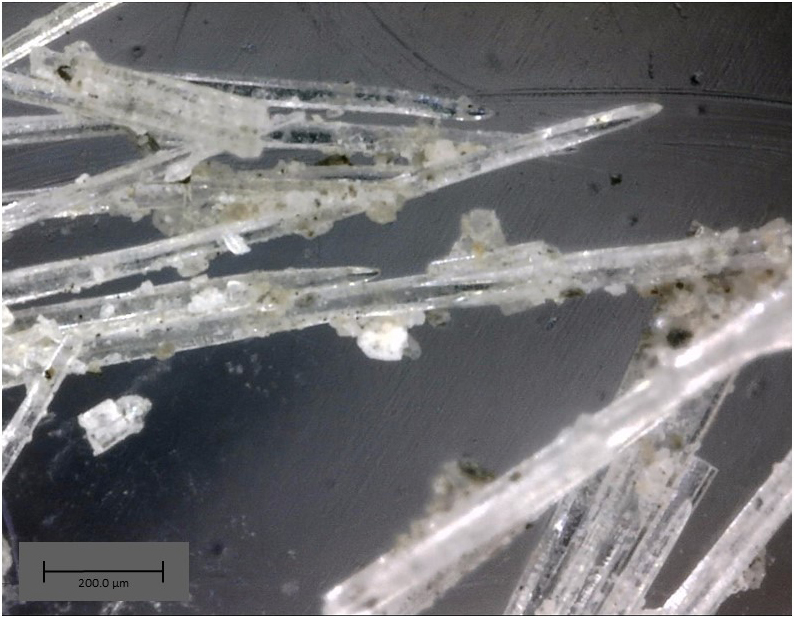 XRF and XRD analysis did not find any asbestos minerals in the sample, but instead the fibers were identified as calcite (fig. 14). Though we had never seen calcite that was fibrous in appearance, it is one of the mineral’s crystal forms. An example is shown in fig. 15 where you can see the SEM image of “lublinite”, a needle-type of calcite whose form is thought to be associated with the activity of microorganisms. Figure 14. 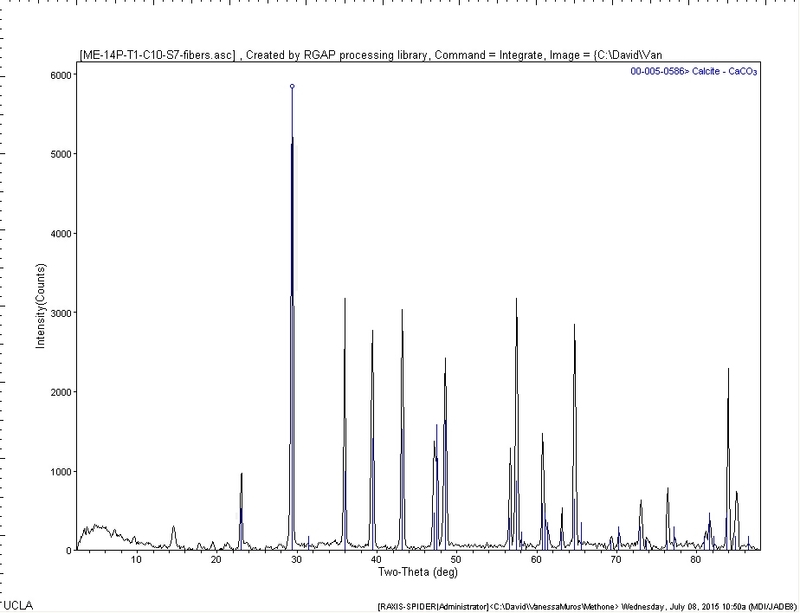 XRD analysis results showing the fibers were composed of calcite. 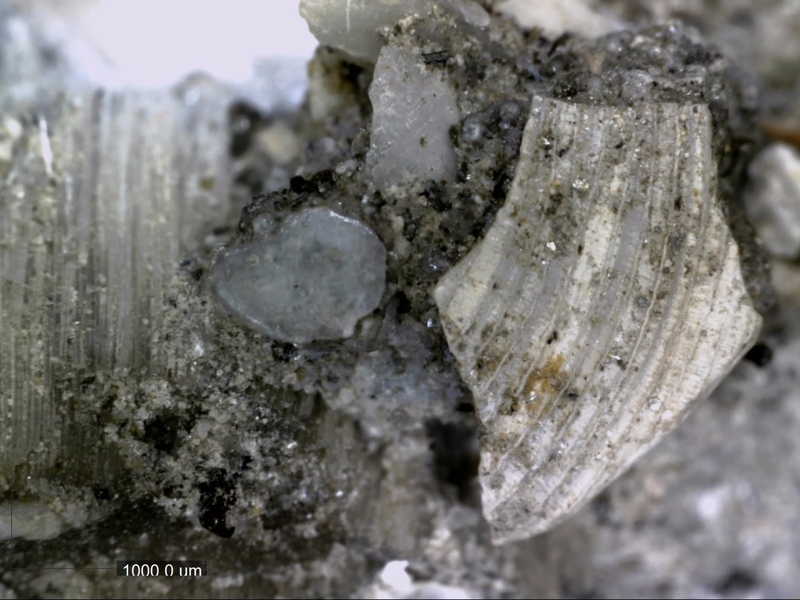 Even though we were not able to identify the fibers as calcite in the field, the use of a stereomicroscope and our makeshift transmitted light microscope certainly helped distinguish their mineral nature and rule out plant or animal origins. And now that we’ve figured out how to make a transmitted light microscope and tested it out, we’re ready for any future material ID questions that would require one. Categories: Internships | Tags: archaeological conservation, asbestos, fibers, fibrous calcite, MacGyver, microscopy | Permalink.